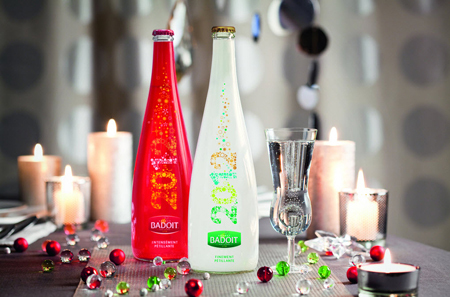 In late fall each year starting 2009, Danone’s carbonated water brand Badoit releases a new limited-edition designer version of its elegant bottle dedicated to the upcoming year. On the heels of Coca-Cola and evian’s numerous design collaborations with fashion geniuses, Badoit started its New Year series as a tribute to the festive season. This began as a student project—in 2009, the brand challenged students of Fine Arts in Paris and the National School of Decorative Arts to create the festive bottle design, and this evolved into a tradition of releasing new bottles by professional designers ahead of Christmas. This year, French agency Sismo was challenged with the task of making new ‘attire’ for the bottles—they developed a fresh and light Ambiance Noël design, simple and graphic, to highlight the brand’s ‘fizzy nature.’ Traditionally, Badoit asks to create new chick and original look for the green and red bottles, these two versions don’t differ a lot, only in their palette. The new look features a vertical ‘2012’ year inscription made colored bubbles, some of which ‘tire off’ the last figure and ‘rise’ to the neck of the bottle, just like air in a glass of champagne.